On side from the get go! How lovely to have such energy and engagement from you all! We had such a lovely time dancing with you. A very early highlight of working in Ramsgate was that first workshop in the Salvation Army Hall. All dancing textures; tornadoes, the sea, military and we turn around and suddenly all the children have cucumber guns! Another special moment was when we did the Circle Dance for the first time at Pie Fatcory Music and the group did that magic thing; suddenly we were all dancing together, people were coming out of their shells and celebrating one another dancing. We loved seeing Eddie dancing to Star Boy, Brian loving the drum n’ bass and Eva beaming as she was lifted over our heads and flown across the stage. The group you created in Ramsgate jelled so beautifully, looking out for and checking in with each other. We loved seeing how welcomed our Dads were in show week, they felt right at home. Thank you so much you wonderful bunch, you are MEGA! Thank you to Looping The Loop Festival. 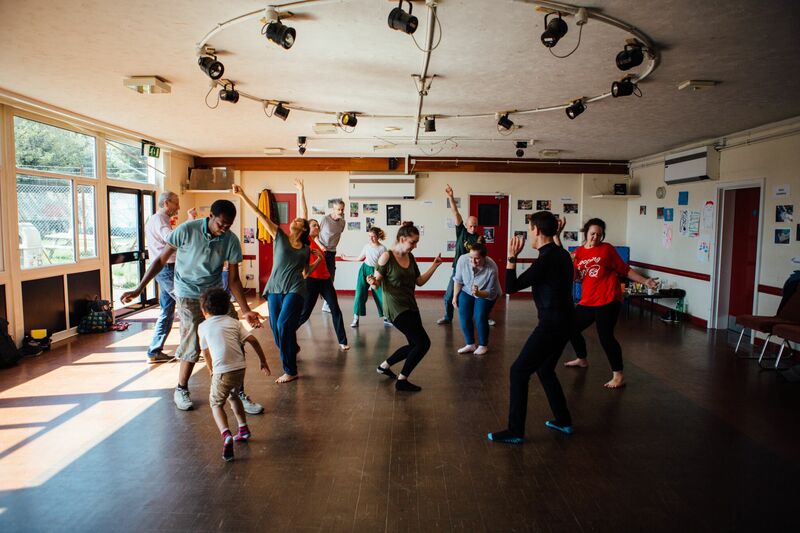 Dad Dancing is touring to Loop The Loop Festival as part of the Collaborative Touring Network project. The Collaborative Touring Network is supported by Arts Council England Strategic Touring Fund, Esmée Fairbairn Foundation and Garfield Weston Foundation.